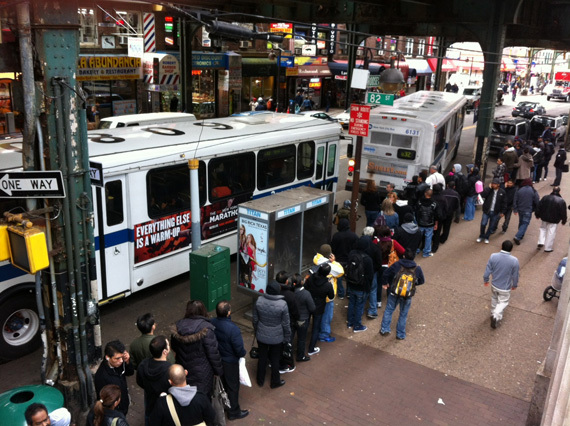 Here’s a look at Roosevelt Avenue and 82nd Street in Jackson Heights earlier this afternoon. Streetfilms’ Clarence Eckerson says the line to get onto these buses snaked twice as long as what you can see in the frame. Buses were already rolling up full and proceeded to crawl along Roosevelt, in traffic, at walking speed. Each of those buses, packed as they were, was probably moving about as many people as all the cars in this picture combined. With HOV restrictions in effect tomorrow, everyone riding the bus won’t have such a sluggish trip. And if the city reserves some lanes exclusively for buses — which seems like it could be in the offing, though specific plans are unknown right now — bus riders can bypass traffic even more quickly. Of course, gridlock on streets like Queens Boulevard was worse today than it usually is, but grinding traffic heading to the free Queensboro Bridge is a fact of life when the subways are functioning perfectly well, too. The steps the city is taking to make the transportation system function during this emergency are pretty close to what needs to be done to eliminate the daily dysfunction on NYC streets: road pricing and busways. Yes, as long as East River bridges are free, folks will flock to them in their private automobiles. As long as there are no HOV requirements, folks will ride by themselves in their car. But with this big boost in traffic due to subways being out of service, the city can really move quickly to make the streets function a lot better. Let’s see how bold they get. Busways are mostly stupid. What that first picture shows you is why we need dedicated surface light rail. Each LRV could hold the better part of both those buses, and the people waiting for the buses wouldn’t need to queue up and wait like that. And that second picture shows us why we need congestion pricing.